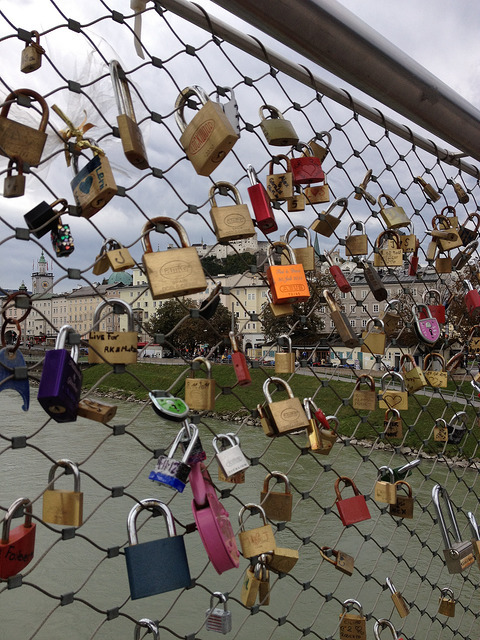 Love locks are a phenomenon in many places. This article linked to here describes how they change a place... Some bridges have had them removed, as the weight of the accumulated metal was causing problems to the bridge's structure... What happened to all those relationships whose locks were cut I wonder? There's a few bridges where I've seen them. The first time I saw them was in Salzburg, in 2012. Here's my picture showing one of the pedestrian bridges over the Salzach.